NOTE: This post is part of A Very Merry MeTV Blogathon hosted by the Classic TV Blog Association. Click here to view the entire blogathon schedule. 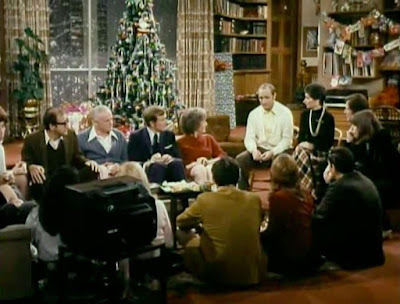 The Bob Newhart Show is one of the few television series to feature a Christmas episode in every season. I wish more shows had embraced the holidays that way, because for me Christmas shows were always special moments. Every year I looked forward to seeing familiar sets decked out in holiday finery, listening to the characters sing Christmas carols, and waiting for those little extras that you wouldn’t see in any other episode – like the Christmas wreath that appeared around the MTM Enterprises kitty logo. These are happy memories inextricably linked to my Christmases past. So it’s wonderful to have not one but six Bob Newhart Christmas shows, which I have listed in countdown format based on personal preference, overall quality, holiday humor and Christmas-y feeling. Don’t call it a worst-to-best list, as even the #6 episode has its moments and is better than much of today’s prime time fare. The holidays play a part in wrapping up this two-part story about an estrangement between Bob’s parents. 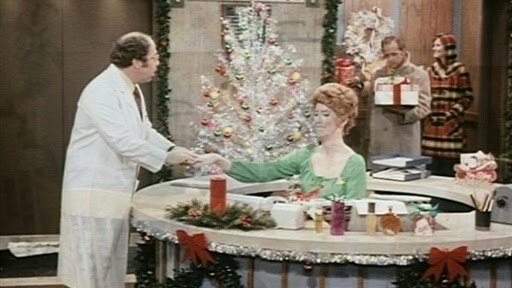 This is the show’s only holiday episode in which Christmas seems like an afterthought, which is particularly regrettable because it originally aired on Christmas Day in 1976. However, do take a moment to appreciate the exceptional tinsel application technique on the Hartley tree. This is the best of Barnard Hughes’ three series appearances as Bob’s father. Carol can’t face going home for the holidays, so she spends Christmas Eve relating her sad life story to Bob and Emily, just as they are getting ready to go to the symphony. Early scenes show undecorated trees at the office and at Bob and Emily’s apartment. Later scenes show both trees covered in lights and ornaments, making for a memorable before-and-after effect. The Mr. Carlin scenes are the highlights, particularly the moment when he tells Bob how he always feels like everyone is laughing at him, setting up one of the show’s trademark elevator gags. Bob invites his group therapy participants to a holiday party. This is a quieter and subtler episode, as was typical of the show’s first season. At this point Howard Borden is merely eccentric, and not the absurd man-child he would become. I also liked the appearance of King Moody, who at the time was playing Ronald McDonald in some of my favorite Christmas commercials of that era. Does McDonald’s still have gift certificates? If they do, they’re probably not 50 cents each anymore. Bob is called back to the office on Christmas Eve by a panic-attacked Mr. Peterson, then gets stranded when a blizzard strikes. The episode opens with some brief glimpses of Chicago at Christmas, and I liked the Santa figure on the Hartley bookshelves. The office lobby went with a white tree this year, and I’ve never been a fan of those. Having spent many Christmases in Chicago, I enjoyed the acknowledgement of how cold it gets, and how the weather can scuttle the best of holiday plans. This is the perfect wintery episode to watch with a cup of hot chocolate (marshmallows optional). In retaliation for Bob raising his group therapy rates, Mr. Carlin hires an organization called Pie Incorporated, which specializes in hitting victims with a pie. Christmas permeates almost every scene in this episode, with wonderful decorations and carols and many other sights and sounds of the occasion. Bob coming home with a lousy Christmas tree is a repeat gag from year two, but in the spirit of the season we’ll let that pass. While the series’ last season is its most hit-and-miss, they pulled off a merry and mirthful final holiday episode. The running pie-in-the-face gag delivers not one but several payoffs, and the group therapy scenes are hilarious. The title says it all: Bob is subjected to the indignities of peekaboo hospital gowns, Howard’s hospital horror stories, and an ancient nurse. 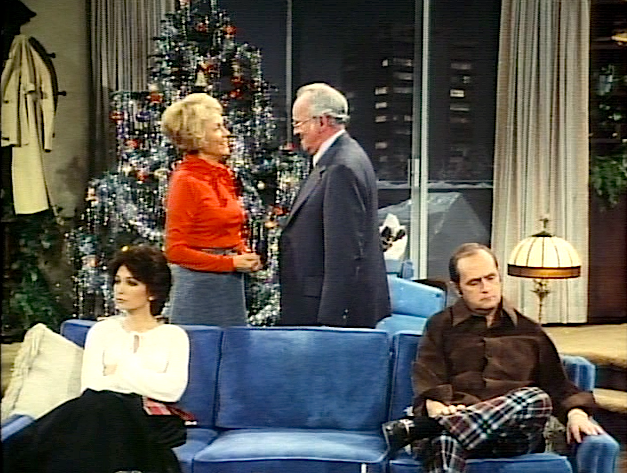 This is the only Yuletide episode where we don’t see a tree in the Hartley apartment. But since Bob isn’t home for Christmas, that sense of missing out on the holidays is thematically appropriate. This is one of the best episodes of the entire series, right up there with the classic Thanksgiving show (“More goo to go!”). There are laugh out loud moments in every scene, from the doctor’s diagnosis to a tree-trimming scene in Howard’s apartment. 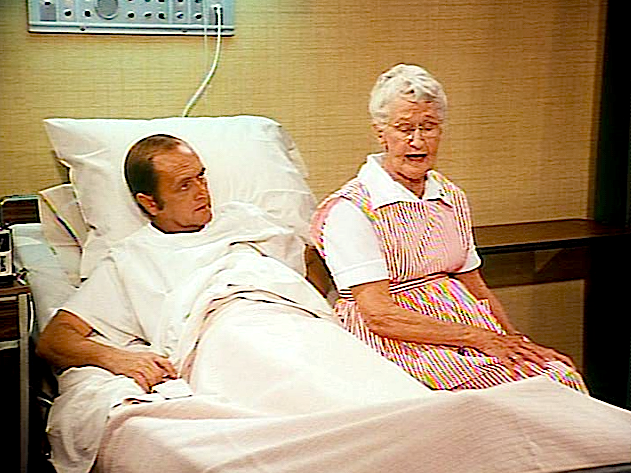 The dotty nurse who takes care of Bob (veteran character actress Merie Earle) gets a laugh with every line she utters, and sometimes when she’s just standing there. 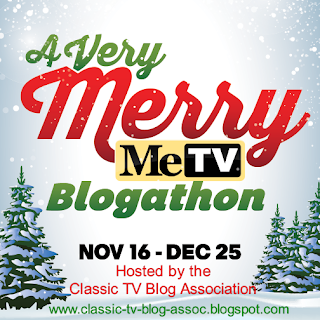 To all of you who, like me, will be spending some of your holiday season with the classic Christmas shows airing on MeTV, Comfort TV wishes you a very merry Christmas and a Happy New Year. A fantastic post on all THE BOB NEWHART SHOW holiday episodes. I haven't seen them every one of them (but am now inspired to do so!). However, I do fondly remember the one where he's in the hospital to have his tonsils removed. Bob in the hospital--that's just funny all by itself. But it's a very well done episode from start to finish and a great example of the show's strengths. FANTASTIC!! Love this show and your tribute to it. What a cast of characters!! I love these Bob Newhart episodes. The Thanksgiving episode you quote is still my favorite of the whole series. Thanks for the reminder.